Joanne T. Parks is the Founder, CEO of Parks’ Place Daycare & Learning Center. Mrs. Parks formerly held the position of Teacher/Curriculum Specialist and Administrator for 11 years within the Duval County School System in Jacksonville, Florida for grades 1 – 5. As a teacher, she was energized by touching the lives of what she affectionately calls “lifetime learners”. At Parks’ Place, her goal is to instill that philosophy into the children that are enrolled. She challenges and encourages children to perform up to their potential, understanding that each child is unique. Her mission is to be excellent in all aspects of child care and learning because she understands what researchers have always known – that children perform better if they do it themselves. That is why she has dedicated her years in the school system to early childhood development. Mrs. 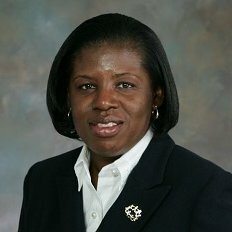 Parks earned her Bachelors of Arts in Education in 1994 and Masters in Education and Leadership Supervision from the University of North Florida in 1998. She is happily married to one of our nations finest, a Master Chief in the United States Navy. She has two children, a son and a daughter, who are both graduates of the University of Florida.